The suit objects were also associated with the elements and temperaments. Somewhere on this forum are some quotes from 16th or 17th century authors giving various ways of doing it. 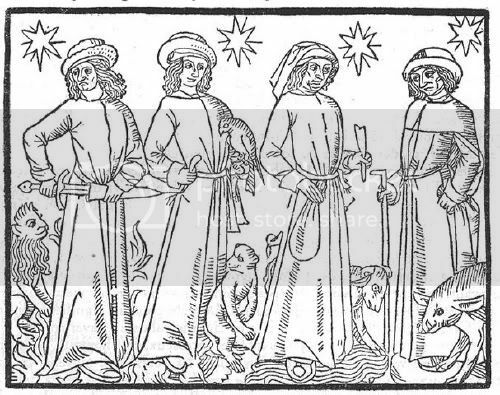 Below I give a c. 1476 woodcut of one way (my source is Laurinda Dixon, Bosch p. 81. The association is clear for coins and swords. The association of cups with water and batons with the wooden falcon-roost the young man has in his hand is more of a stretch. For our purposes it doesn't matter how it was done, only that it was done. The associations are clear?? Maybe for people with really good eyesight and a knowledge of latin! The associations are similar to the well know Shepherd's Calendar. In the Shepherd's Calendar, I believe the Watery Phlegmatic temperament is personified as a merchant, perhaps on the other woodblock as well. This was a common association. 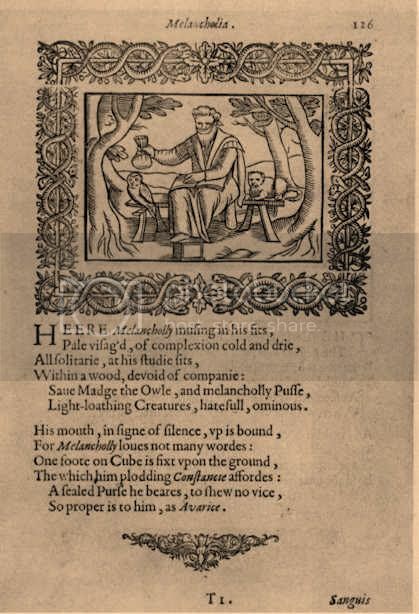 Avarice however was associated with Earthy Melancholics, as illustrated below. For folks wanting to apply the Four Elements to the tarot suits this gives them an option of using either Earth or Water for the suit of Coins. Keep in mind, the REAL attributes of elemental Earth can not produce the sort of divinatory meanings we find in popular tarot, like Waite's deck. The actual attributes of Elemental Earth are cold, dry, withdrawn, miserly, and self absorbed. Watery attributes will produce a closer set of characteristics to the popular Coin suit meanings. Water as Cups is probably the worst of all the popular tarot associations. The divinatory meaning they use simply can not possibly be associated with Elemental Water. Water is cold, wet, conforming, unemotional, and lazy. The Cup attributes fit perfectly with Elemental Air. RAH, over the years I've become quite a fan of your associations. I remember being quite sceptical when I first encountered them, but part of my studies last year was one medieval medicine, and I became quite swayed to your point of view during that time. Do you know this book? (I am not sure if we have discussed it before... quite possibly). The Anatomy of Melancholy was written by Robert Burton, who was the vicar of the church just a few blocks from my house in the early 17th century. He seems an amazing man and people have loved his book for centuries. Oh yes. It is one of my 'desert island' special select! You've got an historical 17th century church a few blocks from your house eh?! Well, I've got rows of pre-fab 'living cubicles', (can't really call them apartments), a conveyer-belt sushi establishment, which is completely lit with florecent tube lights, a karaoke box complex, and about 700 vending machines, one of which sells authentic worn under garments of "cutie high skool sailor gals" . (Yes, it is very much like being in the Twilight Zone.) WANNA SWITCH?? Is that a gondolier on your avatar?? I meant, they are clear in the woodcut. even for someone like me who doesn't know Latin. The correlations are all over the place in the literature, as I think was established in another thread here. The only thing they seem to agree on, when they talk about it at all, is that suits correlate with elements-- or if not directly, then seasons, temperaments, or whatever else was correlated with elements. I have no opinion about what the correlation either was, for the most part, or should be. 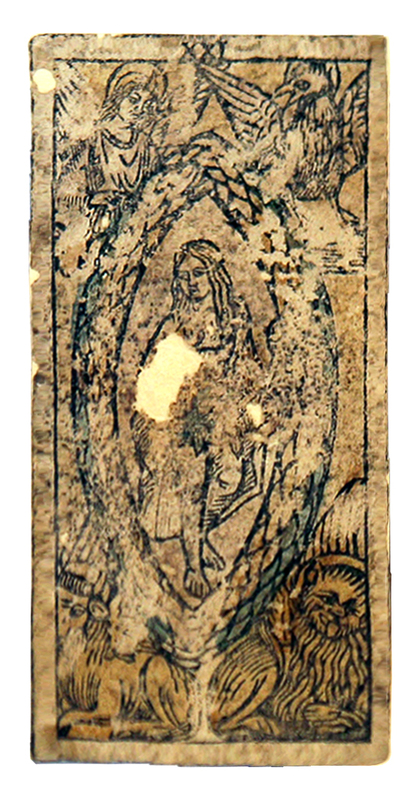 Here is a colour image of the World card found at the Castello Sforzesco in 1908. The deformation is not 100% perfect proportionally, but the colours are at least visible. The b/w image in all books was taken when the cards were held between two thin glass plates, perfectly flat. Now, as you can see, they are glued to paper backing, and curve. The more I look at it, the more I am convinced that it can only be Jesus Christ, in the triumphant "Ecce Homo" mode. If anyone would like to work further with it, I can send you the original pictures in PSD format, or as they came out of the camera (not sure what that format is). Thank you Ross! I doubt that it is possible to make any better processing of the photograph than what you have already done. I was not aware that the card bore some traces of the original colors. This really is a wonderful image! It seems strange that "XXI" is on the border of the card. Would it be covered by the "fold-over backing", if the card had one as the card at the left in your photograph? You're right, this card was not found with a backing - as far as I know. And if it had one, it would cover the number, unless a space were made expressly for it. The Sun card from this find is also numbered, and has a pattern on the back, not a fold-over (rabat). 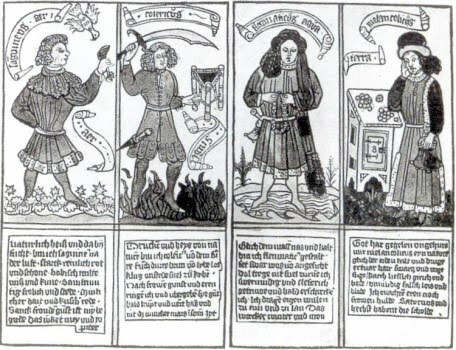 All the cards are shown with their backs in Kaplan Encyclopedia of Tarot II, 289-296 (only Latin-suited cards; the French-suited cards also found at the same time are not shown by Kaplan). 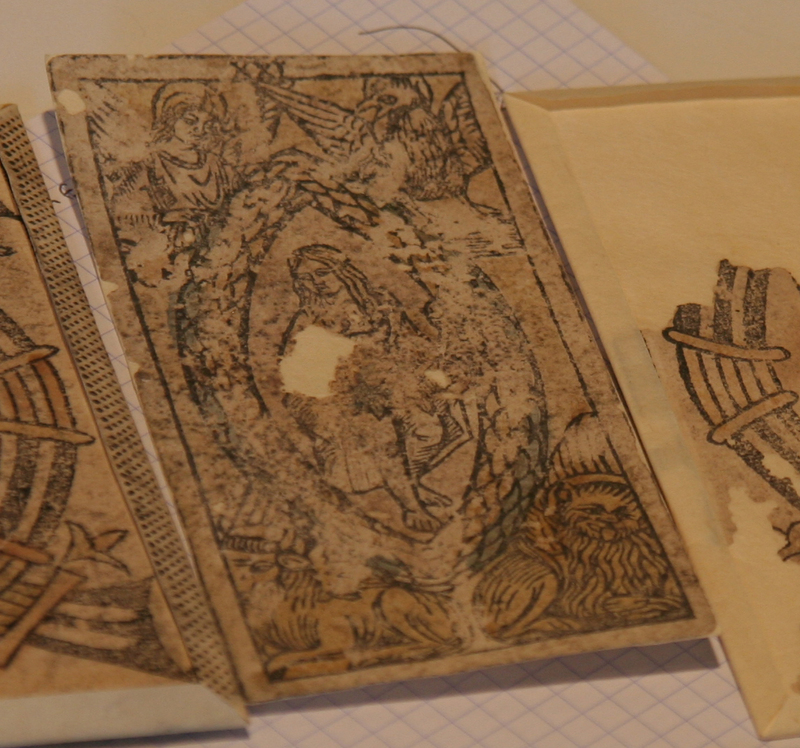 They were originally displayed between glass plates, each card with its back, if found. Sometime in the past 2 decades, they were taken out and reassembled - if the card had a back, both were put together over a thick middle piece of cardstock (glued); if no back, and fragile (like the World), the card was simply glued to a piece of cardstock; if entire, like the Sun, it was left alone. If the Sun is French (style), it seems possible the World might be also. But the World and Sun do not come from the same set - the sizes are very different. To me, it looks like an addition after the card was designed. 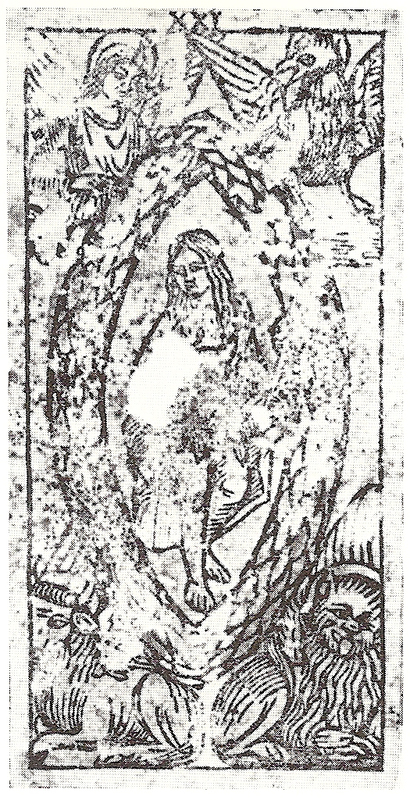 Most Tarot de Marseille have an area set aside for a title and number. This looks like an afterthought, the image is not disturbed, the number put in the "border" area. I believe the image existed alone, and then the number was either added by a later printer into the border area, or added by hand, but I don't believe it is part of the original design.